Paul Ajosshi: Five Reasons Why You Need To Go See "Old Partner"
1. 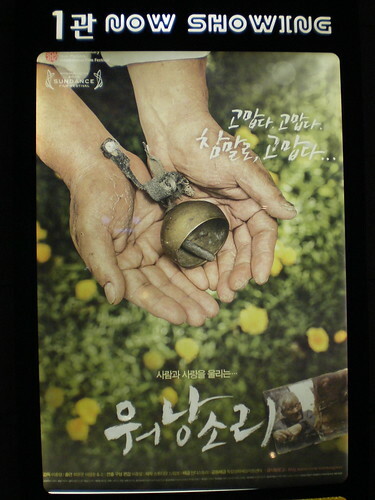 The film gives us a chance to see a Korea which may be wholly unfamiliar. For those of us living in Seoul, we never see what life is like outside the metropolis and while we may see the elderly at markets, on buses or around the city, we may never get a chance to see how they live. This film focusses on one couple, but can bring a wealth of understanding about the elderly community and their place in a rapidly changing society. As well as showing the suffering they have endured to ensure their children's success in life. 2. Watching this film on dvd at home is incomparable to the experience of watching it in the cinema with an audience. I was surrounded by ajummas and ajosshis, who talked all the way through the film (which on other occasions I would have been annoyed by) and it was fascinating to see how they reacted to the story unfolding on screen and how their reactions compared to my own. For the short duration of the film I felt a common bond with the audience and felt a little closer to understanding older Koreans. 3. Support independent and documentary film-makers. Korea has its good and its bad when it comes to film, but more often than not unfunny comedies and sappy love stories get the big bucks and the big publicity, while more interesting projects are left to rot. This is a country where the award winning 지구를 지겨라! (Save The Green Planet!) was shunned, yet 조폭 마누라 (My Wife Is A Gangster) got the funding for two appalling sequels. Stand up for interesting cinema and make sure that we never have to watch 아유레디 2. 4. Support english subtitling for Korean language films. If we're lucky we get a chance to see one or two subtitled films at the cinema every year (the most recent being "The Good, The Bad and The Weird"), but if foreign crowds don't flock to these screenings then maybe we won't get any more. I for one, am very eager to see 박찬욱's (Park Chan-wook) new film 박쥐, but I'd much prefer it if the lovely people at CGV Yongsan put out a subtitled version. 5. It's a very good film. If you're a fan of tragic love stories or you enjoy documentaries or you have a secret passion for oxen then this is the movie for you. This is the best documentary I've seen in the past year and it deserves an audience. So if you are in Seoul and interested in catching a glimpse of rural Korea then head on down to Yongsan for a subtitled screening of Old Partner. Thanks to Korean Pop Wars for highlighting the screenings. According to Naver.com screenings for Sunday 1st March are at: 0910, 1100, 1250, 1440, 1625, 1810, 2005, 2200, 2350. For Monday, Tuesday and Wednesday (2, 3, 4 March) times are: 0850, 1040, 1230, 1420, 1610, 1800, 2000, 2155, 2345. There are no further listings, but new times for the week are generally released every Wednesday. Hello, Paul Ajosshi, I happened to drop by your blog and love it. If I had been seen the movie with you, I couldn't have kept mum myself like those other Ajummas ^^. i'm confused why there should be an english subtitled version in the first place. Interesting point badlywritten. We're very lucky that the Korean government and Korean Film Council provide english subtitled screenings for certain films. I think one reason for providing subtitles is to promote Korean films globally and help understanding of Korean culture. English speaking residents of Seoul are fortunate enough to be able to enjoy these films and I that's why I feel passionate about encouraging people to go out and support these screenings. It may also be that the film industry recognizes possible financial gains through english subtitling of Korean films, last I heard there were one million foreign residents in Korea. If marketed correctly it might be possible to tap into that market and get a few hundred or thousand bums on seats. Perhaps the Korean speaking populations of London, New York and Sydney are not vocal about their need for Korean subtitled screenings. Has anyone in these populations actively campaigned for korean subtitling of films? This year's plan of subtitling 10 Korean feature films in english was down to a suggestion by a citizen on a Korean website. Some people are vocal in their support for English subtitling, so that may encourage the government to provide facilities and funding. In any case as an English speaking foreigner in Seoul, I'm very glad that I have the occasional opportunity to watch Korean films subtitled in English. Well there are nearly a million foreigners in Korea now and granted they all don't speak English. However how can it not hurt the Korean film industry to provide a few locations where we can see movies and contribute to the economy. Or we can just keep our money and download movies online badlywritten! "i'm confused why there should be an english subtitled version in the first place." Paul Ajosshi already explained why, but I would also add that the filmmakers probably had English subtitles made already in order to submit the movie to international film festivals and film markets, so they may as well use it in Korean market. In this day and age, it can be a great internet viral marketing tool to boost the movie's visibility in foreign markets. Imagine more expat bloggers like Paul Ajosshi raving about this wonderful little Korean movie that hasn't opened anywhere else in the world, and how it can hype up the movie among the filmgoers in other countries. All that can only be good for the Korean film industry. "there's no korean subtitled version of movies at the cinemas in london, ny, sydney etc"
Wrong. There's a four-screen cinema complex in Los Angeles that shows two Korean movies with English subtitles, and two current release Hollywood movies with Korean subtitles. Thanks Frank, it's great to know that Koreans have access to Korean subtitled films in L.A. The Korea Times says he wants to sue every uploader! Hello! I just discovered this movie's existence today, and wondered if you know if it's still playing in Seoul/Yongsan? Also, I just got to Korea in January, and am still figuring my way around, so any tips on how to find / reserve tix and show times online in English? Thanks a lot! I am a huge fan of documentary films. It seems like Old Partner maybe ending its cinematic run, but who knows we may get some more screenings. I hope you get a chance to see it.